This grass is a dwarf version of Sisyrinchium bellum but shares similar characteristics. 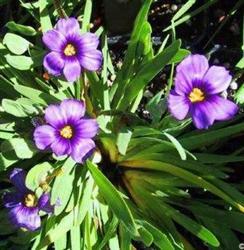 It has striking blue-violet flowers on this 6 in to 12 in. grass. It is highly recommended for rock gardens as well as bordering a pathway. It does really well in full sun and doesn't need a lot of water.